Nov. 16, 2018 – Smaller operations and lower costs have added up to higher profits in Quebec, and the result is more young people getting into the business. It’s mostly good news for the region compared to two years ago. 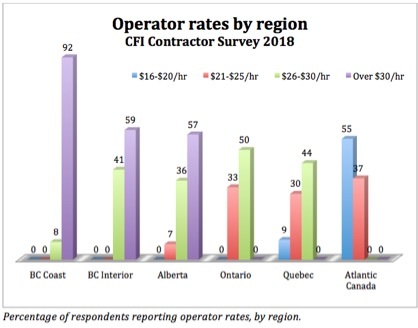 Two years ago a national survey done by Canadian Forest Industries and Operations forestieres et de scierie magazines found Quebec contractors worked less and made less than colleagues in the rest of Canada, but they were also younger by far. We completed another survey this year and the results are even more positive for Quebec. More Quebec contractors seem to have had some luck negotiating rates over the past couple of years. Compared to our 2016 results that found just 17 per cent saw a rate increase over five years, in 2018 that number jumped to 34 per cent. That moves Quebec out of the bottom spot for rate negotiations, which now falls to Atlantic Canada at just 28 per cent. Still, 34 per cent is a far cry from the 64 per cent of loggers who saw a rate increases in neighbouring Ontario. And while profits have slipped for the average Canadian contractor – a worrisome 28 per cent claim to have made no profit – in Quebec the situation is looking much more positive. 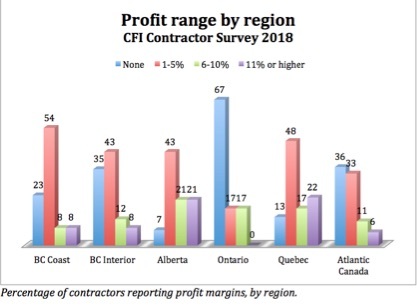 In fact, Quebec and Alberta were the two best regions for a contractor to make a profit last year, with 22 and 21 per cent of contractors respectively posting profit margins 11 per cent or higher. All told, 87 per cent of Quebec contractors had a 2017 profit of at least 1 per cent, and for 39 per cent that profit was 6 per cent or higher. Higher profit margins are at least partially explained by lower operational costs in Quebec. Just 38 per cent of Quebec contractors rated machinery purchase as having increased significantly, compared to the 62 per cent national average response. In Quebec the most keenly felt cost increase was fuel. Not surprisingly given regional economic differences, machine operators in Quebec are paid less than those in Western Canada, but receive a similar wage to operators in Ontario. Earnings drop significantly for operators in Atlantic Canada. In Quebec 44 per cent of contractors are paying between $26 and $30 an hour, while another 30 per cent pay $21 to $25. Just 9 per cent fall in the $16 to $20 an hour range. By comparison, in Atlantic Canada 55 per cent of operators earn $20 an hour or less, and none pay over $25. Still, the Quebec average wage of $25 an hour falls below the national average of $29, which likely results in some skilled operators migrating West for higher paying jobs. When it comes to benefits, Quebec contactors are less likely to offer some form of benefits than other Canadian loggers, particularly when compared to Ontario. Only Atlantic Canada is less likely. While in neighbouring Ontario 83 per cent of contractors offer some benefits, in Quebec just 45 per cent do so. That number has dropped from the 50 per cent who offered benefits in 2016. Yet money isn’t everything, and more Quebec contractors seem to understand that work-life balance is a big factor in job satisfaction. In that respect, little has changed over two years. In the 2018 survey, just 39 per cent of Quebec loggers report working 55 hours a week or more, only one per cent higher than in 2016. This is in direct contrast to the rest of Canada, where at least half of respondents work 55 or more hours. Quebec also has the highest number of operations that run fewer than 70 hours a week (69%), as well as the highest percentage of part-time operations that run fewer than 20 weeks a year (17%). Quebec contractors compared to their Canadian counterparts and more specifically their neighbours to the west, run smaller in terms of company size, revenue and volumes. Loggers there harvest an estimated average of 110,000 cubic meters. The companies in Quebec are pretty evenly spread out among the under 750,000 categories. The largest percentage, 23 per cent, produce between 10,000 and 25,000 cubic metres. These numbers are relatively similar to those in Atlantic Canada, save for the 14 per cent of Quebec loggers producing between 250,000 and 500,000 m3, which in Atlantic Canada is zero. By comparison Ontario contractors pull in an estimated average of 181,000 m3, with 66 per cent over 100,000 m3. It follows then that Quebec loggers have significantly lower annual revenues than those in Ontario, and only slightly higher than their Atlantic Canadian neighbours. 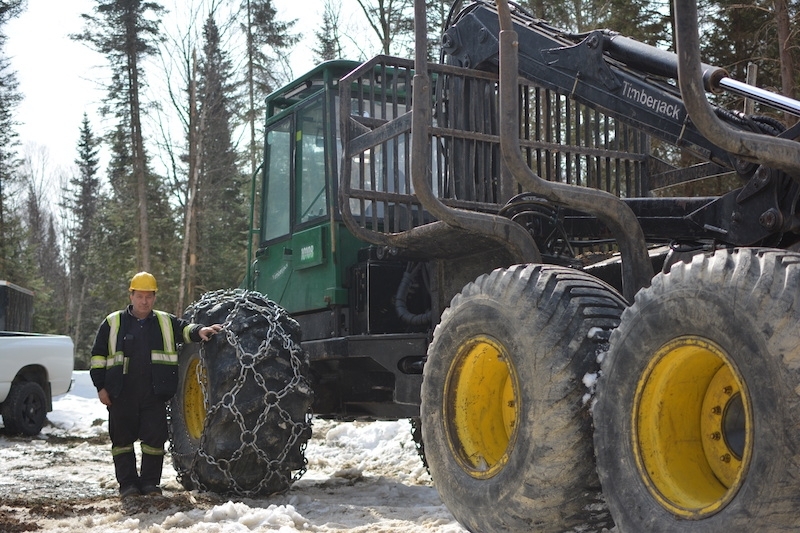 The estimated average annual revenue for Quebec loggers is $2.3 million. In Ontario that number jumps to $6.2 million, and in Atlantic Canada it is $2 million. In terms of fleet sizes, Quebec has the lowest numbers in Canada with 52 per cent of Quebec loggers running between one and three machines. The average operation there runs just eight pieces of iron. Even Atlantic Canada averaged higher at nine. Ontario loggers run the most equipment with an average of 46 machines. Not surprisingly then, Quebec hires fewer employees than average, with 44 per cent of loggers running with 1-5 in full operation mode. Just 12 per cent operate with more than 20 employees. These numbers may be good news for the region over the long term since they mean a lower bar for entry for new contractors. 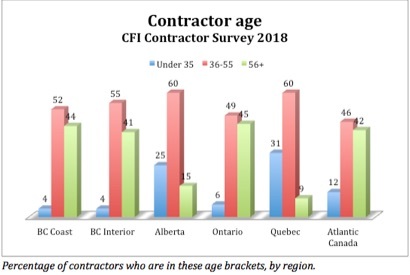 Smaller companies, fewer machines and employees, and lower revenues likely explain why Quebec contractors are among the youngest in the country. The estimated average age in Quebec is just 40, which, compared to a national average of 49, is a good sign for the longevity of the industry. A healthy 46 per cent of Quebec loggers are between the ages of 36 and 45, and another 31 per cent are under 35. Only Alberta has comparable numbers with 25 per cent of contractors there under 35. In Ontario just 6 per cent are under 35, with 45 per cent over 55. As a result of their younger average age, Quebec loggers expect to be in the industry for the longest; the average is 15 years. Almost a third say they will be in the industry for another 20 years. These younger loggers help explain why 57 per cent of loggers in the region say they do not have a succession plan for the business. While in other regions like B.C. – where nearly half of the loggers expect to be out of the industry in less than five years – succession planning is essential for the companies to stay afloat, in Quebec it is less of a concern. What is nice to see in Quebec is that just nine per cent say they will sell or auction their equipment and shut down. In Alberta and the B.C. Interior that response jumps to over 20 per cent. While Quebec loggers are still looking to improve their industry – citing concerns about attracting the next generation and negotiating better rates with sawmills – it seems based purely on the numbers that loggers in the province are fairing somewhat better than their counterparts across Canada. That’s not to say things can’t improve further. A higher profit percentage on a much smaller revenue is expected and does not leave much room for take-home earnings. And the fact that they cannot offer employees much in the way of benefits does not speak well for the next gen. Still, other regions should take note, particularly of the younger demographic in Quebec, and consider what needs to change. Missed last week’s survey snippet? Find a collection of reports published to date here. Look for more news from the CFI 2018 Contractor Survey in our enews over the coming weeks, with a final digital report in December and a summary in the November/December print issue. Be sure to subscribe to our free enews to get all the latest industry news. The survey was conducted in June 2018 by independent research firm Bramm & Associates, generating over 275 replies to a detailed list of questions. Respondents were distributed according to the geographic breakdown of the forest industry, with 40 per cent in Western Canada, 25 per cent in Quebec, and the rest found in Ontario, Atlantic Canada, and central Canada. Within B.C. responses were split between the BC coast and Interior. Many thanks to our sponsors for making the research possible – Hultdins and Tigercat.